In 1877 a young would-be physician walked into the Edinburgh Royal Infirmary and met an attending physician who seemed already to know everything there was to know about him just by making a few astute observations. Dr. Joseph Bell had a habit of showing off his highly refined detective skills in order to impress upon his students the importance of taking a careful survey of a patient before launching into treatment. This so impressed medical student and writer Arthur Conan Doyle that when he published A Study in Scarlet, his first detective novel, nearly a decade later, Dr. Joseph Bell’s mad skills of observation showed up in the habits of a brilliant consultant named Sherlock Holmes. When asked about his inspiration for his beloved consulting detective, Conan Doyle always answered that the character was drawn from Joseph Bell, himself a famous surgeon and forensic scientist known for drawing large conclusions from minute evidence. The two had worked closely together for a few years, as Conan Doyle clerked for Bell, a kind of Dr. Watson to his Sherlock. It probably makes sense that Bell might show up in his student’s work. I recently became re-introduced to Sherlock Holmes when my oldest son discovered him. My son cut his teeth on the BBC show Sherlock in which the modern-day Holmes is brilliantly portrayed by Benedict Cumberbatch, but then he made this mama proud by plowing his way through Arthur Conan Doyle’s original works as well. So, when he recently turned fourteen, we celebrated with a Sherlock Holmes party, complete with a mystery to solve, a deerstalker to wear, and a little brother dressed up as John Watson. He made a good Sherlock, though I’m happy to report he’s a little more socially aware than the character. I don’t blame him one bit for rejecting the honor. Holmes is something of a single-minded sociopath with little use for other people and a significant cocaine addiction. He’s a fascinating character and if I’m ever falsely accused of murder, I’ll want someone just like him on the case. But I wouldn’t want to hang out with him. Because many of the people I do hang out with regularly are writers, I’m not surprised to read that Conan Doyle’s most famous character was inspired by someone he knew. That kind of goes with the territory when you are friends with a writer. Never mess with a writer. I even once had a professor who boldly confessed that the “friend” character in every novel he’d ever written was almost exactly based on a boy he’d known growing up. I’ve never done anything so blatant. None of my characters has ever been intentionally patterned off someone in my life, but I’m sure if I really thought about it, I could recognize bits of those I know and love within my work. I suspect that’s true of most fiction writers. Like Conan Doyle’s famous detective, we draw inspiration from a variety of places—ourselves, great books, and yes, occasionally from people we know. I guess that might bother some folks. Maybe it bothers you. It just kind of makes me want to be the type of person who could inspire a great character. And that sounds like a good goal for 2019. Christmas is almost here and I admit, the season is starting to get the best of me. So . . . please enjoy this throwback post, originally written in December of 2014. And Merry Christmas! If you were to walk into my parents’ house at Christmastime, you would see an artificial Christmas tree strung with lights and topped with the same lighted, multicolored star my parents have had for as long as I can remember. At this point I’m pretty sure the star contains more bailing wire and superglue than original material and still it’s held together mainly by the sheer will of Christmas spirit. Well, that, and maybe a little sticky candy cane goo. 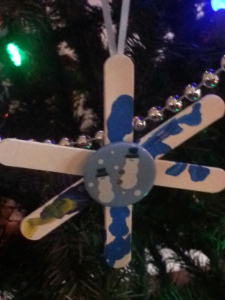 The most precious ornaments are always made with Popsicle sticks put together by little fingers.